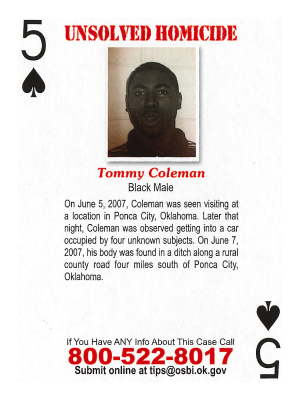 On June 5, 2007, Coleman was seen visiting a location in Ponca City, Oklahoma. Coleman was observed getting into a car occupied by four unknown subjects. On June 7, 2007, his body was found in a rural county road four miles south of Ponca City, Oklahoma.